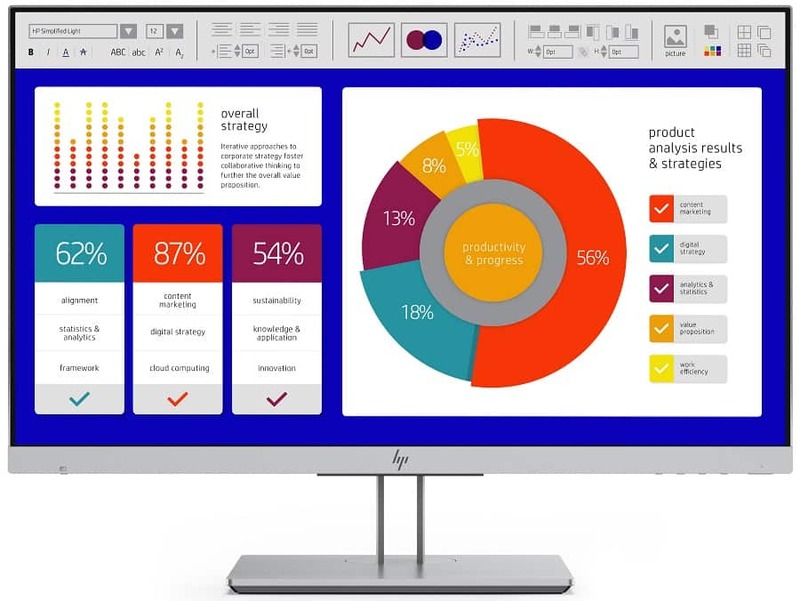 The HP EliteDisplay E243p revealed at CES 2019 is a unique solution for enterprise use that requires data privacy and security in its priorities. The monitor’s unique Sure View Privacy feature solves a company or organization’s concerns of securing their work by effectively hiding the display from snooping. The HP EliteDisplay E243p is made for business use, but its unique capability is something the gaming industry could use as well. The HP EliteDisplay E243p sports the brand’s sophisticated aesthetic that’s composed of premium materials and savvy finishes. The monitor comes in matte silver up front and matte black at the rear to sport a cleaner look. The display is bezel-free, save for the lower strip which houses a logo and some of the product’s functionalities. Initial images for the HP EliteDisplay E243p suggest that it uses an archaic OSD button layout placed under the bottom right of the bezel. While this design works for most, we think it will be difficult to access the Sure View Privacy feature as needed. The monitor would benefit from hotkeys or even a wired remote so users won’t need to get confused with multiple fidgety presses. The whole package is modestly proportioned, making it easy to fit it into tight cubicles or small desks. Final dimensions and weight are still forthcoming, along with three other models in the Elite line for professionals. 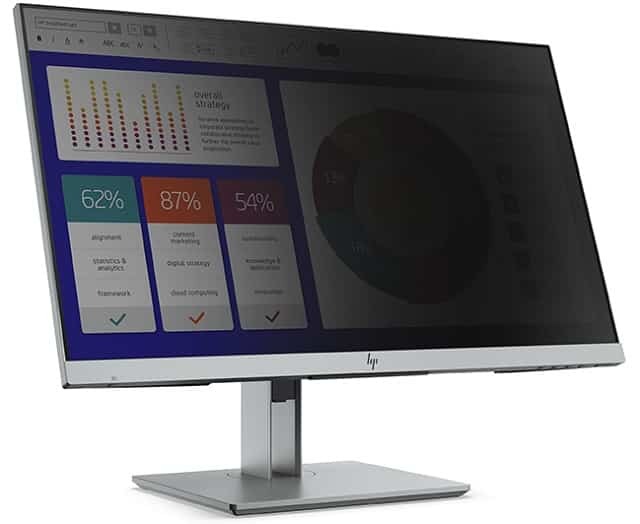 The HP EliteDisplay E243p ships with a full-featured stand that is as adjustable as it is attractive. The squarish base is thin and flat, while the two slim uprights add a nice minimalistic appeal and a slot for cables. You can tilt, swivel, pivot, and adjust the height, plus you can drop the included mechanism for a VESA wall or desk mount. 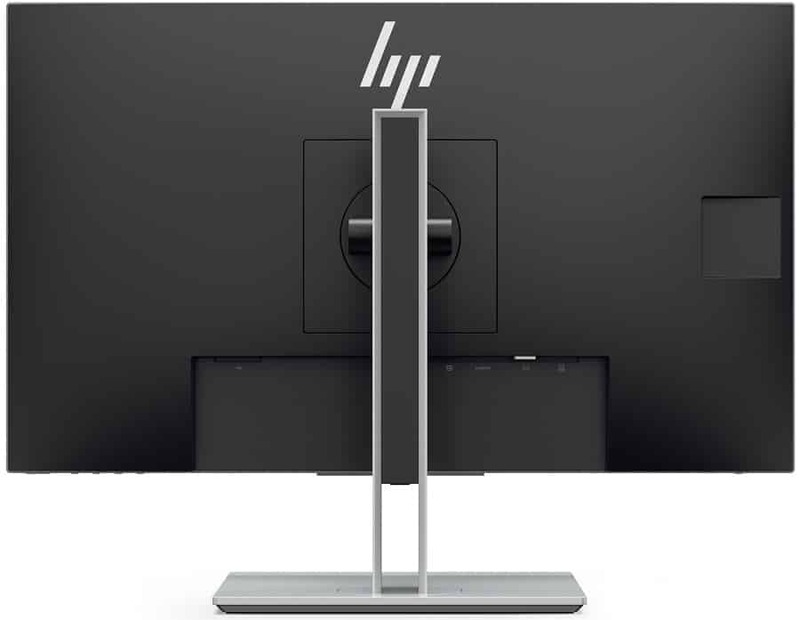 The base specifications of the HP EliteDisplay E243p’s IPS panel isn’t cutting edge, so it comes with a pretty standard set of connectors. The layout includes DisplayPort 1.2 and HDMI 1.4 as primary inputs, along with a D-Sub connector for older devices. There is also a pair of USB 3.0 ports for accessories, but built-in speakers aren’t definite at this time. The HP EliteDisplay E243p sports a 24-inch IPS panel with a 1920 x 1080 resolution, 60Hz refresh rate, and a 5ms to 14ms response time. A typical contrast ratio of 1000:1 is also specified, along with a reasonable 260cd/m2 maximum brightness. This module doesn’t utilize wide gamuts or DisplayHDR capabilities, but we’re almost confident it can at least reach 100% sRGB. What sets the HP EliteDisplay E243p’s panel from the rest of the pack is the unique 3M optical film coating along with the brand’s proprietary implementation. The user-controllable feature is called Sure View Privacy. The display will be able to effectively hide the screen’s contents from viewers other than the user sitting at the desk. When Sure View Privacy is enabled, it will limit the screen’s brightness to 180cd/m2 while limiting horizontal viewing angles to eighty degrees. Individuals trying to peek at the screen’s peripherals will see a darkened view that’s beyond worse than TN’s limited viewing angles. The feature keeps sensitive data safe from prying eyes while allowing the user to continue his workflow unimpeded. Companies and organizations in finance, healthcare, security, or even the military need a display like this since most of their workstations deal with sensitive data. Manufacturers have offered numerous solutions before to help keep sensitive data from leaking, but they were not as effective theoretically as HP’s Sure View Privacy technology. The main issue with these older monitors is that they used permanent films from OEM or aftermarket sources. This treatment did an excellent job at hiding the display’s contents, but the problem was it was not removable. Users have to deal with extremely dim screens or limited viewing angles, which makes the displays restrictive. The HP EliteDisplay E243p aims to change this limitation since the anti-peeking feature can be turned on or off via the OSD. However, we wish the drivers for the monitor could add an automation feature to the Sure View Privacy protocol, enabling it only for programs which require it. We also believe the tech has its applications in the gaming monitor space for E-Sports scenarios or internet cafe. Peeking at the enemy’s display is one of the oldest and most persistent ways to cheat, so having a gaming-grade display like this model would be fantastic for gaming in public. The HP EliteDisplay E243p isn’t particularly cutting edge, but we find its Sure View Privacy plus feature intriguing. The capability will ensure that data privacy is always upheld while employees or workers’ workflows aren’t affected permanently. We could also see a small window of viability in the gaming space if the specialized capability gets popular. The HP EliteDisplay E243p is scheduled to launch by February with a steep $379.99 price tag. The product will become available with three other monitors, including models with built-in webcams. You can visit HP’s official page for the Elite monitor line and you can check back on this page for the latest news.